Showbiz is a poem by Charles Bukowski. It reflects on dealing with ambitions and expectations. The poem is the starting point for a short film collaboration project I organized. I invited filmmakers from all over the world to make a cinematic interpretation of the poem. Three crews responded: a band of filmmakers from Detroit, One group from London and my buddy and longtime collaborator Bertin from Nijmegen. They all send in their raw production footage which Bertin and myself first compiled into individual stories. We then went on to mix these stories into one collage of struggling actors from all over the world. The music is by Berlin-based artist Rijnder Kamerbeek. 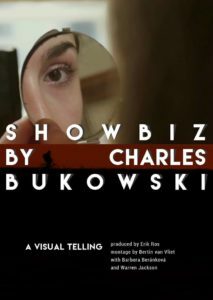 Showbiz by Charles Bukowski is currently on the festival circuit. If you are interested in a private viewing, or you would like to screen it as part of your event, please contact me. Showbiz is part of the official selection of London Short Film Presents at The Institute of Light.